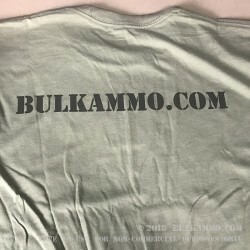 BulkAmmo.com Olive Drab T-Shirts. Hit The Range In Style!!! A great BulkAmmo.com T-Shirt made by Next Level in olive green. 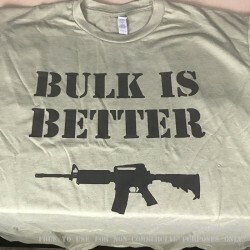 With an AR-15 on the front and the tagline "Bulk is Better", show your fellow shooters you're the type of shooter who buys in bulk! Available in an assortment of in-stock sizes this shirt is a 60/40 cotton/polyester blend and feels great to the touch --- not as cheap as a lot of the promotional t-shirts you'll find elsewhere! Bulk Ammo was kind enough to send me a t-shirt after a large order I placed to review it for them. I got a medium, which fits me perfectly, I'm 5'8" and about 160 lbs. There's not much to say except that it's a good solid shirt, especially considering that it's a promotional item. Fully as advertised 60/40 cotton polyester from manufacturer Next Level. The only bad thing I found about it was about 2 stitches that hadn't gotten colored and were raised out during manufacturing possibly, we'll see how those last after a couple months of use... But after about 4 washes it's held up. I wore it to the range and it got noticed and brought up as a conversation starter. It's comfy, it's nice enough I put it into my regular rotation of t-shirts It is a little expensive I think considering it's promotional, but shirts of this kind would also run 15-20$ on Amazon.